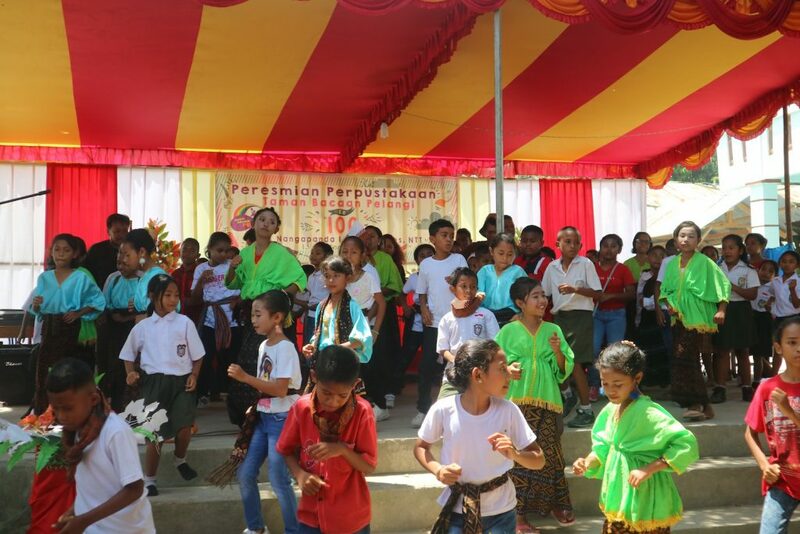 A Big Milestone: Inauguration of Our 100th Library in Eastern Indonesia! 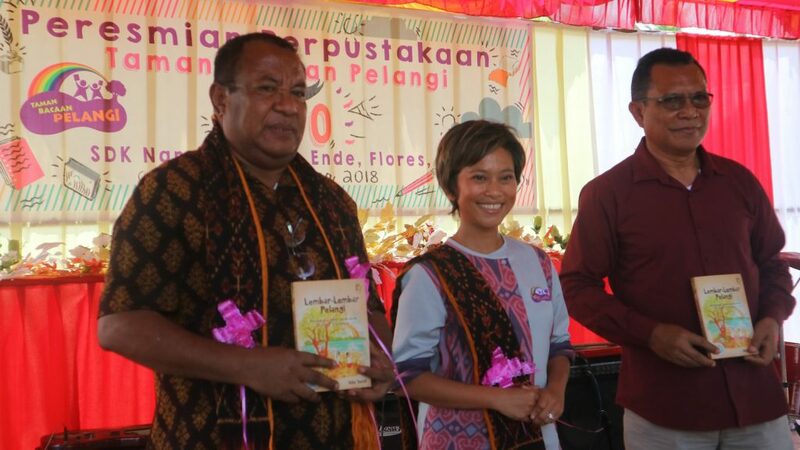 Never crossed my mind that this day would come: inauguration of Taman Bacaan Pelangi’s 100th Library in Eastern Indonesia. What a milestone! 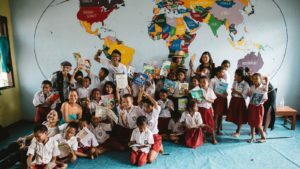 When I got the idea to set up a children’s library in a small village in Flores, I never thought that it would be a big movement. My best friend told me that it would become big, like a snowball effect. I didn’t really think much about it. Back then, I thought, yes, for sure I’d set up more than one library… but.. a hundred? I didn’t dare to dream about it! (but hey, now I’m convinced that we have to dream BIG!). 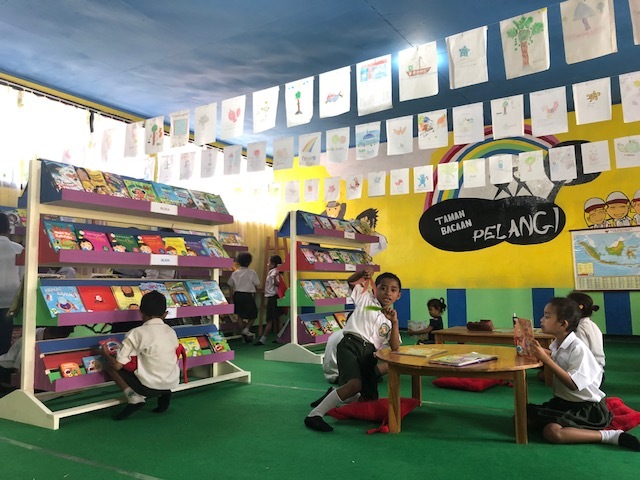 The inauguration of Taman Bacaan Pelangi’s 100th Library was a proof that so many people in Indonesia (and the world) CARE about the future of the kids in Eastern Indonesia. There’s so much love for them. 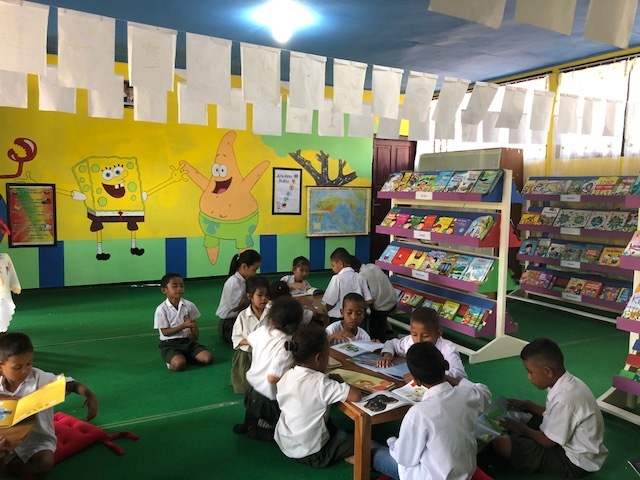 And all of us want them to succeed in the future, in which one of the ways to nurture them is by providing access to high quality of children’s books, instilling the love of reading, and setting up child-friendly libraries in their schools. I’m beyond grateful that people believe in our mission and support us! I believe, when we want something, the universe will conspire in helping you. The journey with Taman Bacaan Pelangi has shown me how true it is. 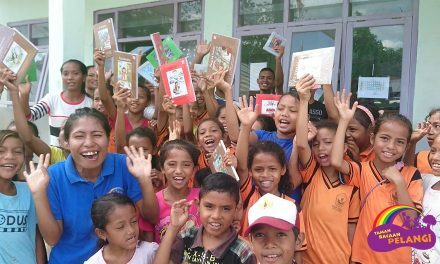 It was such a sunny day when we opened our 100th library in Ende, Flores, East Nusa Tenggara. The library’s located in SDK Nangapanda 1, Ende. More than 200 people attended the event. The Regent of Ende couldn’t make it, but he sent his Assistant who’s in charge of handling primary schools to attend the event. To my surprise, the Regent of Nagakeo Dr. Don came with his wife! Wow. Such an honor for all of us to have him there. 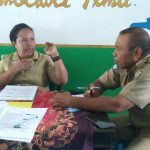 Among the VIPs was the Head of Education Department of Ende, Mr. Pieter Guido No, Head of Library Department of Ende Mr. Martinus, Head of Public Relations of Ende, Mr. Gabriel, and head of villages, school principals, local leaders, etc. Before we started the opening ceremony, the whole VIPs had to walk from the main street, accompanied by the whole entourage of musicians playing traditional instruments. How fancy! The Regent’s Assistant whispered to me, “It’s very seldom to have these real traditional musicians performing in public, nowadays. This is very very special”. I nodded, feeling grateful and honored to have the chance to witness such a rare musical performance. In front of the school gate, another traditional dance was performed. All the female teachers wore traditional costumes and dance beautifully. So nice! And it didn’t stop there. The whole inauguration ceremony was filled with traditional dance performances by students from different grades. Very nice! After the inauguration ceremony, everybody dances their heart away! In the speech the he wrote, the Regent of Ende mentioned that the reading interest in Ende was still low. School libraries were poorly managed and not in a good condition. Children’ didn’t like going to the libraries. Why? Because the libraries were not attractive and the books provided in the library were not suitable for children. 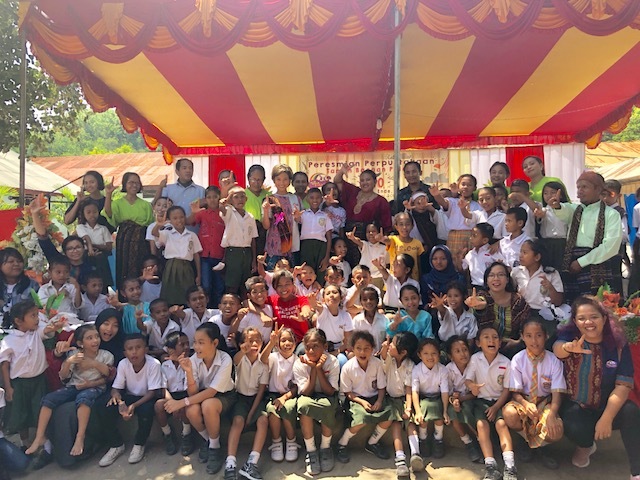 Thus, the Regent of Ende appreciated the work of Taman Bacaan Pelangi in his region, setting up child-friendly libraries in 38 primary schools, providing high quality of children’s books for the kids, training the teachers, and revamping the libraries to make them look attractive and appealing to the kids. The Regent of Nagakeo mentioned in his speech that he hoped to collaborate with Taman Bacaan Pelangi in his region. Of course, we’re happy to hear it! For us, collaboration with the local government ensures the sustainability of our library programs. It would be perfect if the local government set aside some funding to set up child-friendly libraries using our model in each region. That would be a dream come true! 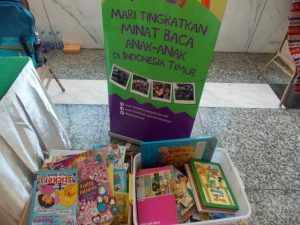 On this note, I’d like to thank Room to Read, our partner who sponsored this 100th library, Education Departments in all the regions in Eastern Indonesia for such a great support, our donors and partners who have been supporting us all these years, all the school partners (headmasters, teachers, librarians), media, and our volunteers. Without your support and generosity, we won’t be able to reach this milestone today! 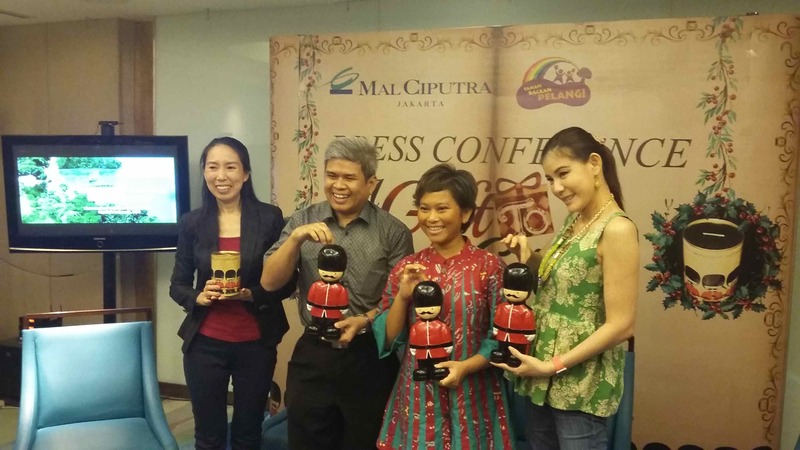 And last but not least… Id’ like to thank Taman Bacaan Pelangi’s awesome team for such a great work!!! Well done, guys!!! I’m so proud of each and everyone of you! 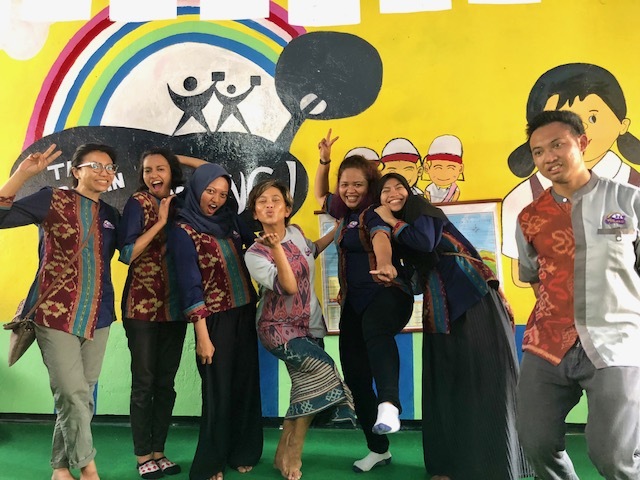 Shout out to Monica Harahap, Mahrita, Jennifer Jacob, Fina Azmiya, Gilang Permata Sari, and Armand Wirjawan who have been working hard going to remote areas in Eastern Indonesia, setting up libraries in primary schools, training the teachers, and… establishing good relationships with the local stakeholders. They’re the ones who put their feet on the muddy roads, going to the off beaten paths on motorbikes, visiting our school partners every single day, living far far away from their hometown. A big applause for these super awesome Indonesian youths! And not to mention my best friends: Eva Muchtar and Ingkan Nasution who have been helping me since the first year I started this initiative. Thank you for believing in me! And not to forget, Nena Brodjonegoro, who have been working behind the scene, but doing all the meticulous admin work, supporting our team. Thank you so much, Nena! Our awesome team members! From left to right: Ingkan, Jennifer, Mahrita, Nila, Monica, Fina, and Armand. We’re missing a few people here on this picture. Having 100th library in our milestone is truly a team’s effort. It’s not my achievement. It’s OUR achievement. And we shouldn’t stop here. We won’t stop here. 100 is a big number, but it looks so small if we compare it to how massive Indonesia is. There are still millions of kids who do not have access to high quality of children’s books. So, let’s build more child-friendly libraries for them, because WORDS CHANGE WORLDS. LITERACY MATTERS. We believe, reading will change their future, and our nation’s future. 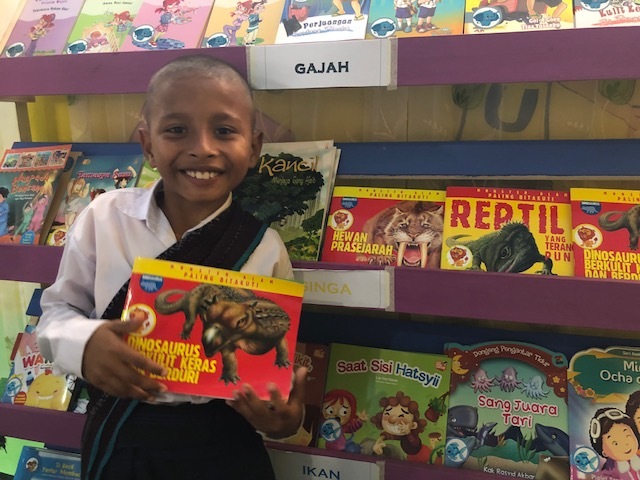 Cheers to building more libraries for the kids in remote areas in Eastern Indonesia! NextIt’s Fun to Be Student Volunteers!